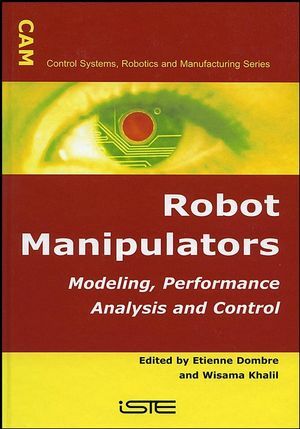 This book presents the most recent research results on modeling and control of robot manipulators. Chapter 1 gives unified tools to derive direct and inverse geometric, kinematic and dynamic models of serial robots and addresses the issue of identification of the geometric and dynamic parameters of these models. Chapter 2 describes the main features of serial robots, the different architectures and the methods used to obtain direct and inverse geometric, kinematic and dynamic models, paying special attention to singularity analysis. Chapter 3 introduces global and local tools for performance analysis of serial robots. Chapter 4 presents an original optimization technique for point-to-point trajectory generation accounting for robot dynamics. Chapter 5 presents standard control techniques in the joint space and task space for free motion (PID, computed torque, adaptive dynamic control and variable structure control) and constrained motion (compliant force-position control). In Chapter 6, the concept of vision-based control is developed and Chapter 7 is devoted to specific issue of robots with flexible links. Efficient recursive Newton-Euler algorithms for both inverse and direct modeling are presented, as well as control methods ensuring position setting and vibration damping. Etienne Dombre is Director of Research at the National Centre for Scientific Research (CNRS) and is a researcher within the Laboratoire de Recherche en ’Informatique, Robotique et Microélectronique de Montpellier at the University of Montpellier, France. Chapter 1. Modeling and Identification of Serial Robots (Wisama KHALIL and Etienne DOMBRE). 1.4. Calibration of geometric parameters. 1.6. Identification of dynamic parameters. Chapter 2. Modeling of Parallel Robots (Jean-Pierre MERLET and François PIERROT). 2.3. Inverse geometric and kinematic models. Chapter 3. Performance Analysis of Robots (Philippe WENGER). 3.3. Workspace of a robot manipulator. Chapter 4. Trajectory Generation (Moussa HADDAD, Taha CHETTIBI, Wisama KHALIL and Halim LEHTIHET). 4.2. Point-to-point trajectory in the joint space under kinematic constraints. 4.3. Point-to-point trajectory in the task-space under kinematic constraints. 4.4. Trajectory generation under kinodynamic constraints. Chapter 5. Position and Force Control of a Robot in a Free or Constrained Space (Pierre DAUCHEZ and Philippe FRAISSE). 5.3. Control in a constrained space. Chapter 6. Visual Servoing (François CHAUMETTE). 6.3. Task function and control scheme. Chapter 7. Modeling and Control of Flexible Robots (Frédéric BOYER, Wisama KHALIL, Mouhacine BENOSMAN and George LEVEY). 7.2. Modeling of flexible robots. 7.3. Control of flexible robot manipulators.